Recently I heard that starting your car engine consumes less fuel than 10 seconds of idling. Being the curious type, I looked for further information and found opinions varying anywhere from 5 seconds up to 1 minute. Therefore I decided to experiment on my own car to determine the truth. 1. Connect a line from the audio line-in of a laptop to your fuel injector to measure the fuel injector pulses. The procedure is described here: http://www.gassavers.org/showthread.php?t=4250&page=2. You do not need to connect to the VSS sensor since we’re only interested in the fuel injector for this experiment. Note that my car has only one injector. Therefore I know that by probing that injector alone I’m effectively measuring all the fuel going into the engine. Fuel consumption is proportional to fuel injector pulse width. If your vehicle has multiple injectors, you cannot know for certain that you are measuring all the fuel unless you probe every injector, but likely probing a single injector would provide reasonable results. 2. Bring the engine to normal operating temperature. Then turn it off for 10 seconds or so, start recording a wave file on the laptop, and turn the engine on (without depressing the gas pedal) and let it idle for a minute or so before you stop recording. 3. Write a nifty program to parse the wave file and record the start and end times of each pulse. I wrote the wave file parser in Excel with VB for applications. If you want to repeat the experiment, you’ll likely need to make some modifications to the VB code to get it to work with your engine (more details in the Excel file). Idling vs starting.zip – This zip file contains the wave file as well as the Excel file I created to parse the wave file and calculate and plot the results shown below. 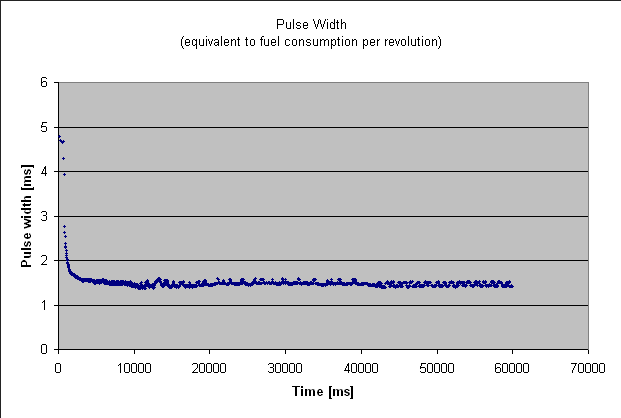 This shows the cumulative injector pulse width, effectively the total fuel consumed. 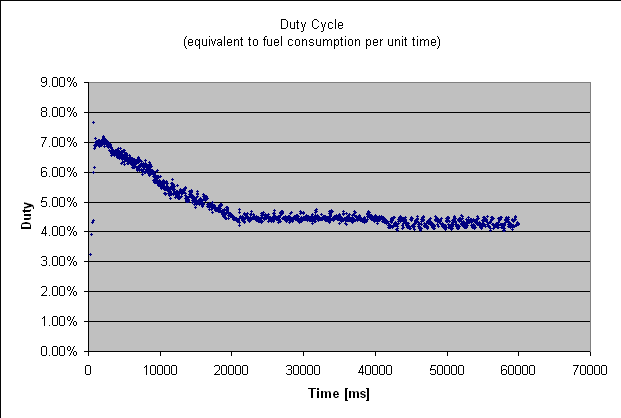 You can see that initially fuel is consumed at a faster rate (the slope of the curve is greater) but eventually if falls off and becomes linear indicating a constant rate of fuel consumption at standard idle speed. The black line is a linear trend line based on the last 5 seconds of data (from 55 to 60 seconds). Extrapolating this line backwards we can see how much earlier we would have had to start the clock in order to consume the same amount of fuel from just idling. The time is about 7 seconds before 0. This means that starting the engine (followed by idling) consumes the same amount of fuel as 7 seconds of idling (followed by more idling).Note that this value accounts for any additional fuel required to recharge the battery to it’s pre-crank state. A well tuned, warm engine starts very easily and 1 minute of idling is plenty to recharge the battery. Further testing would be required to determine how much of the 7 second value above results from the higher idle RPM and how much results from recharging the battery. Given how closely the injector duty cycle curve below matches the RPM curve, it seems likely that most of the additional fuel is due to higher RPM and that battery recharging has a negligible effect. A good additional test would be to measure battery power draw (voltage * current) during regular idling and just after starting for comparison. This is a closeup of the cumulative injector pulse width for the first 3 seconds. The dark blue points are the actual injector data. It’s interesting to note that although the injector pulse width is much greater for the first second or so (see pulse width plot below) the fuel consumption rate (as indicated by the slope of the cumulative pulse width curve) is actually lower since the engine is at such a low RPM. I’ve heard many claims that the fuel consumption rate at startup is much higher than normal but that does not appear to be the case.The three straight lines show what the consumption would be at standard idle speed for comparison. The 7 second equivalent idle time shown in the above plot is misleading because it assumes the engine is just left idling after starting in which case the additional fuel consumed is mostly due to a higher idle speed setting for the first 20 seconds or so (see plots below). But regardless of whether you were idling or stopped, you will likely press the gas pedal within a few seconds after t = 0, and then your fuel consumption will be the same in either case. The three lines shown are all the same slope as the linear trend line in the above plot showing normal idle speed fuel consumption. They have been offset to intersect the fuel consumption data curve at 1, 2, and 3 seconds respectively. It is apparent that the “idle time equivalent of starting” is related to how quickly you start extracting useful work from the engine after starting it. If you can do this within 1 second (which is not difficult), then restarting the engine consumes the same fuel as idling for about 0.2 seconds. If you take 2 seconds, then restarting the engine consumes the same fuel as 0.7 seconds of idling. If you take 3 seconds then restarting the engine consumes the same fuel as 1.3 seconds of idling. Unlike the 7 second value in the first chart, these values do not take into account fuel that may be consumed to recharge the battery to its pre-crank level. Therefore the true value may be a little higher but will still likely be much less than 7 seconds. This shows injector pulse width as a function of time. Injector pulse width is an indication of fuel consumption per revolution. Note that the injector pulse width is much greater for the first second or so. Effectively the engine is doing more work per revolution during this period in order to accelerate up to idle speed. The injector pulse width is also an indicator of energy input per revolution. Energy is equal to force times distance. The distance in this case is constant (one revolution). Therefore, the injector pulse width is also an indicator of force (or more appropriately torque since we’re talking about rotation). The torque is high when the engine is accelerating quickly up to idle speed, but drops to a roughly constant value when the RPMs are not changing quickly. This constant pulse width at idle can be thought of as representing the torque required to overcome engine friction. 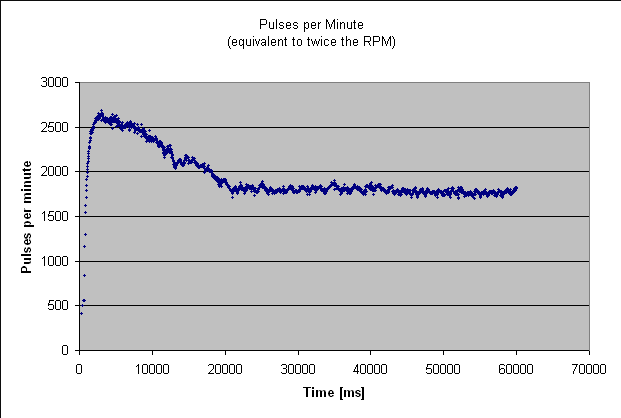 The pulse width must be greater than this in order for the engine to do any useful work.In spite of the higher RPM for the first 20 seconds or so, the pulse width is relatively constant. This indicates that the torque required to overcome engine friction is roughly constant, independent of RPM. This shows the injector pulses per minute as a function of time. The injector is fired twice per engine revolution. Therefore the plot should be exactly twice the RPM. Looks about right. Whereas the injector pulse width indicates the amount of fuel injected per revolution, the duty cycle indicates the amount of fuel injected per unit time, or in other words, the fuel consumption rate. The fuel consumption rate in litres per hour is equal to C * duty_cycle where C is a constant that could be determined by further experimentation. Notice that the fuel consumption rate does not show any significant spike near the beginning as one might have expected. The curve matches the RPM curve almost exactly, except during the first second of acceleration when fuel is consumed faster to bring the engine up to speed. Effectively during the first 500ms, enough energy (fuel) must be added to overcome engine friction and store some kinetic energy in the engine in the form of increased RPM. After the first second, this curve matches the RPM curve almost exactly, indicating the fuel is only overcoming engine friction and not doing any additional work. In other words, after one second, the increased fuel consumption for the remaining 20 seconds or so is due only to the higher RPM setting that kicks in just after starting. It appears to be true that starting your car consumes less fuel than 10 seconds of idling. In my case it consumes about the same amount of fuel as 7 seconds of idling. However, the additional fuel consumption observed seems almost entirely due to a faster idle speed setting for the first 20 seconds after starting. Any good driver would start moving within 1-2 seconds after starting, which would effectively eliminate the fast idle losses by extracting useful work from the additional fuel being injected. If you can begin extracting useful work from your engine within 1 second after starting the engine then it appears starting the engine consumes fuel equivalent to about 0.2 seconds of idling. This is not accounting battery re-charging after starting, but that appears to have a negligible effect. How much fuel can be saved? This will depend heavily on the environment in which you drive and the degree to which you are willing to turn you engine off. Using engine-off-coasting techniques described in How to reduce your vehicle’s fuel consumption I’ve found that in a typical commute through the city it’s not difficult to have the engine off about 30% of the time (without adding any time to the trip). Let’s assume a typical city commuter drives 15km in 30 minutes each way to work, 250 days a year (250 hours and 7500km in total just commuting to work, not including any other driving). A ’92 Geo Metro consumes roughly 0.5 litres per hour at standard idle speed and consumes about 5 litres of fuel per hundred km of single occupancy travel. Therefore, if I were a typical commuter, my savings would be about 75 hours of idling or 37.5 litres per year out of about 375 litres total or about 10%. If you only turn your engine off when the vehicle is stopped (ie you don’t use engine-off-coasting) you might expect to see only a 5% increase in mileage. The above experiment is for a ’92 Geo metro. Results may vary from one vehicle to another. This experiment was performed on a warm engine. The results will be different on a cold engine since the engine management system injects additional fuel during a cold start. However, the standard idle speed is also higher on a cold engine, so the effects may cancel. Further experimentation would be required to determine how many seconds of cold idling is equivalent to a cold start. Generally it’s been recommended to me not to stop and start a cold engine, but I’m not certain if the reasons for that are based on actual data or just opinion. I have little faith in popular opinion without data to back it up. I have only considered fuel consumption and not overall cost or overall impact (GHG emissions, pollution, etc). Stopping and starting your engine frequently may cause faster wear on the engine and starter and may result in additional costs for early repair/replacement of components and additional energy consumed to repair/replace those components. However, I question whether those costs would outweigh the savings of a 10% reduction in fuel consumption. I originally posted this article on a different site. Here are the original comments. Great job. There are a few things to take into consideration. The lower the voltage (which is true during start), the wider the pulse width to the injector. 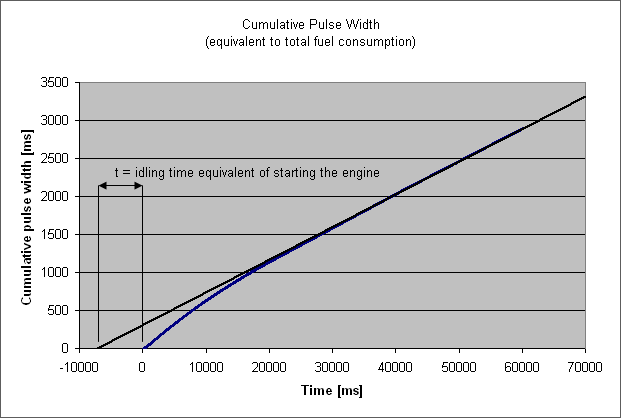 This wider pulse width does not correspond to more fuel. The fuel injector reacts to power input. At lower voltages, you need a wider pulse to get the same power (electrical power) to the injector. The conclusion from this statement is that although the pulses are higher during crank, the amount of fuel is not as high as the pulse width would lead you to believe. There is more, but a lower percentage more. Which lowers the 7 second time even more. Great job again with nothing but a laptop as your data collection equipment. Hi Brian, Thanks for the comment. That’s a very good point. For a 7 second period I think the effect would be relatively insignificant since the voltage will be high for most of the time, but the fuel volume estimated during cranking (when the voltage drops significantly) will be overestimated. For more accurate results I would have to calculate the volume of fuel based on both the pulse width and the voltage (pulse height). The voltage should only affect the amount of time it takes the injector to open and once the injector is open, the fuel flow should be independent of voltage. So a better formula might be (Volume = A*PW – B*V – C) where PW is the pulse width, V is the voltage and A, B and C are constants. Calibration would be required to determine A, B and C (ie I would run the injector with different dummy signals with known values of PW and V and see how much fuel is expelled in a given time). Something to consider for future experimentation. The data may also be available somewhere already. I think the logic that less fuel is flowing when injector voltage is lower is mostly faulty. The injector is an on – off valve. It is not proportional in any way. 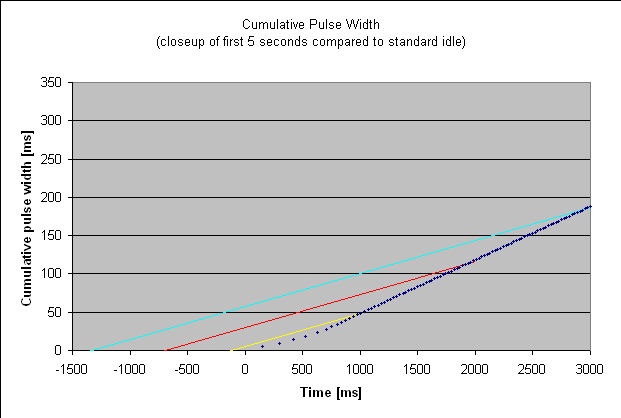 Pulse width modulation performs flow control. The only issue in question is whether or not the valve takes significantly longer to open with reduced voltage under starter load. There are two types of injectors and the current controlled type injectors would probably operate exactly the same during starting as the do normally. I’m not certain about different types of injectors. Perhaps there are constant current injectors today as you say. Then I agree it makes sense the opening time will be constant, regardless of battery voltage. I do know that earlier fuel injection systems simply applied battery voltage to the injector for the duration of the pulse. On these types of systems, the opening time is related to the battery voltage. The change in opening time was significant enough that fuel injection computers were (and maybe still are) programmed to compensate for it by sensing battery voltage and increasing the pulse width by an appropriate amount when the battery voltage was low. Using pulse width alone as an indicator of fuel consumption on such a system will yield a high estimate when the battery voltage is low. Based on the voltage profile I measured on my injectors, I see no indication that they are current controlled. I initially thought you’d figured out how much energy/gas would be used starting a car vs idling and when it’s worth shutting your car off, including energy from the starter/battery which eventually makes its way from burning gas. I suppose you could use an ammeter on the starter cable then back off the efficiency of the motor-alternator-battery to figure out gas used to start might be a way. Hi Daddyo, The amount of energy drawn from the battery for starting a warm, well tuned engine is easily replaced by the charging system within the first minute of running the engine. Thus battery recharging is taken into account by my analysis looking at the cumulative pulse width in the first minute after starting (the first plot) and extrapolating a linear trendline backwards in time. Some of the additional fuel consumed is due to recharging the battery, some (probably most) is due to higher RPM after startup. Guys, have you any idea of the wear on an engine not set up for constant shut off and restart? Your oil pressure drops to zero. You have excessive cycles of low oil pressure operation, not to mention that your transmission is not designed to be brought into gear as you apply power all in the first second after starting. I appreciate what you are trying to accomplish, but don’t do it with a conventional engine. Buy a hybrid. They are “engineered” (to a degree) for this kind of “abuse.” Of course, that does not mean they don’t get beat up, but the car manufacturers see no downside to our replacing components rather then buying more gasoline. A lot of pollution is generated building transmissions, engines, starters and the like. Hi Ron. The fuel savings vs equipment lifetime debate is an old one. I purposefully did not address this issue because it tends to be hotly debated. Instead, I mentioned it as a disclaimer (#3) at the end of the article. While your arguments are logical, your conclusion, “don’t do it with a conventional engine” is not. In any choice there are costs and benefits. The existence of the costs does not necessarily mean the net result is negative. Let’s throw out some numbers. Suppose engine lifetime is decreased by around 20%, suppose an engine normally lasts 100,000km (pessimistic) and suppose the cost of a rebuild is $1500. Thus the “engine cost” of driving is about $1.50 per 100 km and the cost of additional wear due to starting/stopping is 20% of that or about $0.30 per 100 km. The fuel cost for my GEO metro is currently about $5.00 per 100 km. So if starting/stopping decreases fuel consumption by 10% I will save $0.50 per 100km on fuel while paying an additional $0.30 per 100 km on engine wear, so I still come out ahead by $0.20 per 100 km. While significant wear may occur during cranking of a cold engine since all the oil has drained into the crankcase, much less wear may occur during cranking of a warm engine that has only been stopped for a short period since there is still a significant amount of oil coating all bearing surfaces. As for the transmission, it does not experience anything different from ordinary driving. It’s quite easy to start a warm engine, bring it up to speed, disengage the clutch and start driving within a couple seconds. It makes no difference to the transmission what the engine was doing prior to disengaging the clutch. Starter lifetime will likely be decreased, but the cost of early replacement of the starter is still likely covered by the fuel savings. Looking at GHG emissions or energy consumption as a metric instead of cost, the results are still likely to favor reduced fuel consumption over prolonged equipment life. Good job, practical use of equipment and a little programming ingenuity. As mentioned in the above posts, injector pulsewidth is modified with cranking voltage as longer pulsewidth is required at lower voltages to compenate for lags in injector open time. The 7 second ramp-in is fairly consistent with the charging voltage ramping in after starting. If I know Suzuki engineers (they were very good at making every drop of fuel count, even on the carbed sprint/firefly/metro) they likely have little to no cranking enrichment with the engine warm. Like the site, the drag cf instructable, I will continue to browse around! Hi Rob, great article as always. Might be bit off the topic but I wanted to know your opinion about traffic in BC. I’ve been living in Vancouver for 4 years now and as much as this is a green city the traffic lights here just drive me nuts. Driving on any main road here like Broadway, KingsWay, Main… makes you stop on every 4th-5th light. I wait at the red light then it turns green but as I start moving I can see down the road light is turning yellow again, knowing that I’ll have to stop and stall over again! This is just pure terrible for environment (not even mention the gas bills). I’m from a small European town but all the main streets have traffic lights set to “green wave” making sure that if one light turns green and you keep the recommended speed all the following lights on that street will be green when you reach them. With such a huge traffic mass every day as in Vancouver I can’t imagine how traffic can be managed by independent intersections and their own sensors (which are great after midnight but terrible at peak hours) … do you have any insight or opinion on that? My opinion mirrors yours. It is utterly ridiculous. I created a fuel efficiency simulation where I can specify different driving scenarios for my car and see the predicted fuel efficiency as well as the energy losses by various means (drag, rolling resistance, braking, idling, etc). For start and stop traffic like you are describing (coming to a complete stop every 4-5 blocks) you are wasting about 1/3 of your fuel on braking and idling losses. Put the identical car in the small European town you described and its mileage will miraculously increase by 50% simply because the braking and idling losses are eliminated. I ditched my last car 10 years ago and have saved thousands of pounds in that time as a consequence as well as become slightly healthier (probably). Still, I find this an interesting discussion. Part of the problem with the stop engine at lights scenario is it is seldom evident how long the lights are going to be red for, especially when you arrive via a bend in the road. Maybe they should make a new type of light which shows in some way how long you will have to wait so that you can make that choice of whether to switch off or not from a better-informed position. Let’s not hold our breaths though. I doubt traffic lights have changed much since they were first invented. BTW, cycling has taught me an awful lot about the conservation of energy when travelling. I seldom have to stop completely at a local traffic light these days because I’m monitoring their status long before I get to them and adjust my approach speed to give me the best chance of not having to stop. It always amuses me to see the drivers rushing past me in order to get to the lights first so they can wait there. I would like to know which engine consume more fuel. A idling engine or an engine running in its low gear.